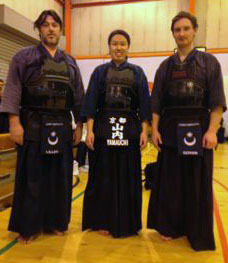 See Starting Kendo for details. Congratulations to Kenny Fry who has been selected for the GB Junior Team at the forthcoming European Championships in Macedonia at the end of March. The Kodokan charity Taikai was held on 5th April. Congratulations to both Kenny & Harry who both won their respective age group competitions and were also placed 3rd in the team event. 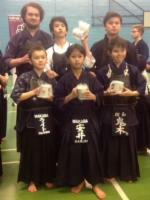 Portsmouth dojo were awarded a Fighting Spirit award in the family competition. Portsmouth were happy to welcome Tashiro Sensei (8th Dan Kyoshi) over the weekend on 28th February & 1st March. Sensei was supported by John O'Sullivan Sensei (7th Dan Renshi) and Yasayuki Hiyama Sensei (7th dan) which ensured a suburb event. Saturday and sunday afternoons were well attended by Portsmouth Dojo members and friends from neighbouring dojos and we were all given a very thorough work out and a lot to think about for future practices. On the Sunday Morning sensei held a special Junior seminar at which we were pleased to welcome other junior members from across the UK. 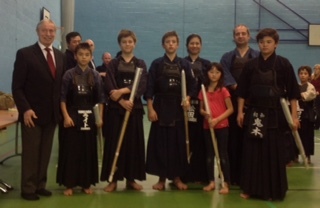 Portsmouth Kendo Club were well represented at the 42'nd Annual Mumeishi 3's Competition entering 2 teams, 3 Ladies individuals and 3 junior competitors. In the Junior events John & Harry displayed tremendous spirit but were unfortunately beaten, (Harry scoring a great Ippon on an opponent much taller than him). Kenny was silver medal winner in his age category and put in 4 great performances. All 3 juniors were superb in their attacking spirit and put in performances to be proud of. In the ladies section, Linda narrowly lost by Hantai but Yuka & Risa both fought their way to the final in opposite halves of the draw against a number of GB Squad & International Kendoka. The final was a fantastic showdown between the 2 sisters with Risa emerging the winner in Encho. Congratulations to both for superb performances throughout. In the team event Portsmouth B (Roger, David, Malcolm) lost to Oxford City Dojo but the 'A-team' (Tommy, Mark, Yuka) beat Akai-Ryuu & Nagamistu before narrowly losing to Tora after a spirited representative match from Tommy. 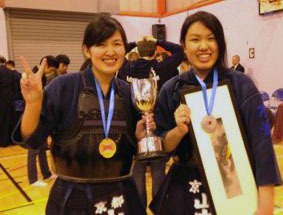 This performance was recognised by the judging committee and Portsmouth - A were awarded the team Fighting Spirit Award. 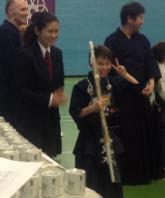 It was a great day's kendo and all competitors should be justly proud of their performance & achievements. We will be running a beginner's class commencing Saturday 11th October. This will last 8 weeks. 5 teams and all teams fought each other. Kenny and John were on one team, and won the competition, Kenny won all 4 Shiai which included the four other captains. John won three one to a Hansoku point, but the other two were ippons. Harry and Zoe were also on the same team, Harry won most of his fights, but lost to an older kid he was fighting to make up numbers. Zoe in her first shiai (and less than 10 times in armour doing keiko) held her own and was 'almost enjoying' herself. Roger got more referee training and refereed two team matches as well as helping the unarmoured section in the morning (lots of games)......... Kenny also had to do some refereeing and the others had some practice with scoreboard, timekeeping and recording. Roger also had the great privilege of being motodachi for a very young japanese kendoka (about 4?) during jigeiko, who waited in line to do some men cuts with him. Congratulations to Chieko for passing her Shodan and Mark Lilley for his Ikkyu. Tommy Goven passed his Yondan, Kenny Fry his Shodan & Chieko Fry her Ikkyu. Taichi Kidani is returning to Japan at the end of this month (May) after 4 years in Portsmouth. He has been a great asset to the dojo and will be sadly missed. We all wish him well and will see him when he returns or on visits to Japan. 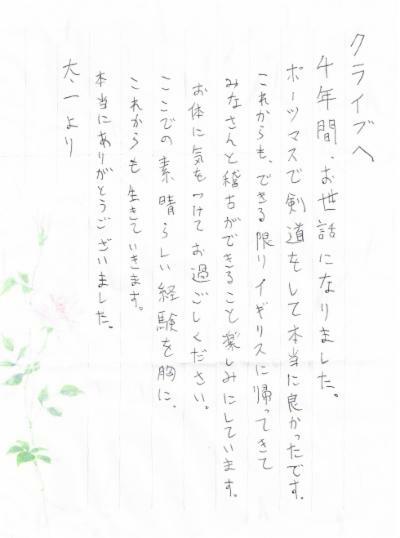 Taichi has left a letter to all his friends at PKC. Translation: "Dear Clive, Thanks very much for the time I spent here for four years. 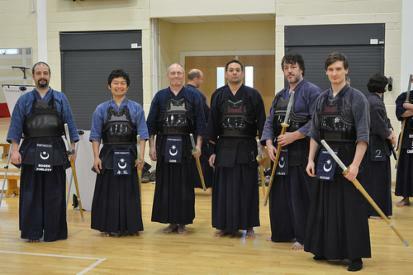 I am really happy about the fact that I could practice kendo in Portsmouth. 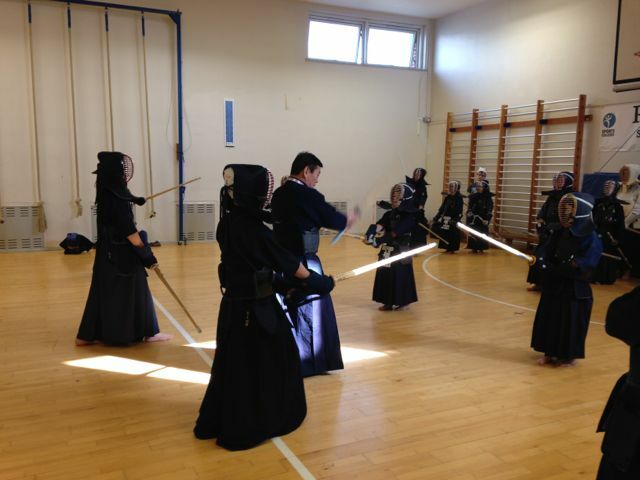 I am looking forward to coming back to Portsmouth as many times as possible and practicing kendo with everyone in our kendo club. Please take care of yourselves. I will live the rest of my life with the great memories that I made here. Thank you very much. 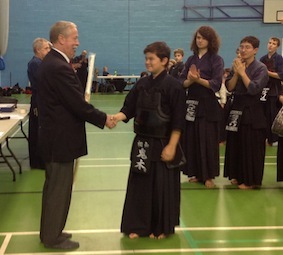 Taichi"
Congratulations to Kenny & Harry for representing Portsmouth in the Kodokan Junior Kendo day. 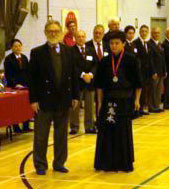 Kenny won his class in the Shiai competition scoring a total of 8 ippon in 4 shiai. Well done - the work for the next grade starts today! Gary passed Shodan & Geoff Ikkyu. Well done guys - that hard work paid off. On wednesday 19th we were lucky enough to have a visit from Inoue sensei (Hachidan, Hanshi). He was accompanied by Geoff Salmon Sensei (Nanadan Kyoshi), Terry Holt Sensei (Nanadan Renshi and John O'Sullivan sensei (Rokudan Renshi). It was a great night. 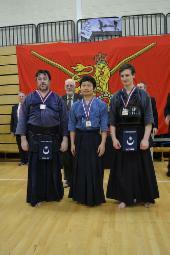 Well done to Jason, Kenny & Harry at the Macmillian Charity Taikai. Kenny took second place, Jason third and Harry won a well deserved Fighting Spirit. 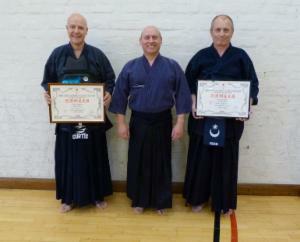 All three below with their awards and Terry Holt Sensei, Nanadan Renshi. We have commenced a Junior's beginners class starting at 12:30 on Saturdays. The junior lessons will be from 12:30 to 13:00. All members are welcome to come and practice kata in this period.